Crisis’ within the family are painful and scary but not uncommon. Families are the tightest units of people in existence and interactions frequently become strained, emotional and even volatile. Families should not have to get through these difficult times alone. There are a number of services available that can counsel, protect, shelter and rehabilitate families as they recuperate from adverse experiences together. Different types of family problems warrant different types of recovery services. Domestic violence problems are some of the most severe a family can go through together. They put one or more family members in physical danger and must be taken very seriously. If the violence is continuous, even if there is a possibility of violence, it may be best for the threatened family members to seek a shelter to stay at. If the violence is over and the family is in recovery together, family counseling could be the best option for the family unit. Mental illness can be a major or a minor problem within a family, depending on the level of severity and how well it is managed. When the affected family member’s mental illness is out of control, it can cause a great deal of strife for the individual and for the rest of the family. Inpatient or outpatient treatment centers are a good option for severe mental disorders as the patient will receive care and supervision around the clock. For those who already know how to cope in a healthier way, counseling is a great option. Addiction or substance abuse causes damage, pain and confusion within a family when one or several family members are affected. These conditions can be very tough to beat and inpatient addiction treatment is highly recommended as it is statistically the most effective treatment. 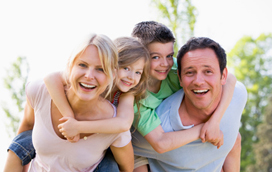 Rehabs will frequently offer counseling services for the whole family. Grief or loss is a situational cause of strife within a family, so it usually does not require clinical or inpatient treatment. Family counseling is the best option for this scenario to help all family members process their emotions. This entry was posted in Uncategorized on April 22, 2015 by Guest. When families go through crisis, trauma or other adverse experiences together, it can be very difficult to regain a sense of normalcy afterward. The family unit does not have the same sense of peace and well being as it used to. In these times of difficulty and strife, it can be very beneficial for families to go see a counselor together to recover from their hardships as a group rather than individually trying to work through what happened. Depending on the type of struggles the family has undergone, different types of family counseling are recommended. Counseling is the best route to take for families who have experienced something negative together, such as a divorce or a death in the family. So long as no family members are severely out of control, counseling makes the most sense for bringing family members together to calmly talk something through. If a family member is out of control, for instance, severely mentally disturbed or violent, an inpatient treatment center may be the place to start. Rehabs or addiction treatment centers are obviously for people who are struggling with addiction or substance abuse. These facilities are excellent for family members who are ready to beat their addiction or substance abuse problem in order to be available to and participatory in their family units. They frequently offer family counseling sessions as well to help the other family members process what their loved one is going through. For …, contact a Canadian drug rehab, addiction treatment center or alcohol treatment program Canada. Treatment centers for people with a mental illness are very important to families that contain mental health problems. This is one of the most common problems to affect a family as one in every four people struggles with some form of mental disorder. Mental disorders can become very severe, even dangerous if left untreated, which can put whole families at risk of adverse experiences. Getting loved ones to the mental health treatment they require is a very important step in family recovery. Support groups are a great option for a family or family member who has been through treatment and needs a form of ongoing support, or for families whose issues are minimal. Many Canadian families go through struggles and can greatly benefit from the services of a professional family counselor. It can be tempting to sweep problems under the rug within a family instead of taking them to a professional counselor who can help straighten them out. We tend to stigmatize those who need counseling as damaged goods or throw away people, which is ridiculous considering that nearly a third of the population is in need of professional counseling. Families who go through adverse experiences together, such as domestic violence, addiction, mental disorders or trauma statistically benefit enormously from professional counseling, Counselors may be needed to resolve a problem that has a long history with the family, such as mental illness, or they may be needed to resolve a recent trauma such as burglary or a family member who was raped. Family counselors can change a situation for the better by intervening into the problem, assessing it and working with the family until they are able to cope with their problems on their own. In intervening into a family crisis, they bring their professional, objective perspective into a situation that has otherwise become out of control and volatile. Simply bringing their presence into the situation does a great deal of good for the family to help them gain perspective on the matter. Professional counselors will often take a neutral stance initially, asking a number of questions, listening carefully to the responses and observing the family’s interactions in order to understand the family’s dynamic and each individual member. Before a counselor will start giving opinions, they will carefully deduce what the underlying problems are within the family. Once the professional counselor feels they have a good read on the family’s circumstance, they will begin guiding them in communication and exercises. This may be as minimal as asking questions to get a family member thinking about their behavior, or it may be as involved as trust exercises where family members fall backward into each other’s arms. A large majority of families who participate in counseling in order to recover from adverse experiences improve immensely in their interactions with one another. Canada is a beautiful country that is known for its high quality of life. It is also a country that sees its share of family crisis’ that require professional intervention. Canada is notorious for its hard winters when there is very little sunlight and vitamin D to be had. This causes mental health and addiction problems to escalate which leads to family disputes and domestic violence. These incidents are detrimental on many levels. Family relationships are damaged, people’s physical health may be put in jeopardy and often times the use of law enforcement and medical aid is required. All of these detriments are better to avoid by taking advantage of the services of a professional family counselor. The services of a family counselor are very important to the crisis’ that families sometimes go through together. Families are in close proximity of one another more than any other group of people. This can lead to volatile conflicts in some circumstances, particularly when there are mental health or addiction issues within the family. Family counselors are very beneficial in these circumstances because they specialize in resolving family disputes and traumas. In many circumstances, families must go on living together, which means they have to find a way to resolve their issues. But old communication and relationship problems can lead to unhealthy cycles and patterns that put a wedge in between family members. Some families are literally unable to resolve their problems without the services of a professional family counselor. Or, it could be that the family has experienced a trauma together, such as the untimely death of one of its members and requires grief counseling. Family units hope that they will not need a family counselor, but there are times when it is absolutely necessary and unavoidable. There is no shame in requiring the services of a family counselor. In fact, approximately one third of families living in Canada require the services of a family counselor at some point. It is very common and understandable in the challenging times we live in.